ARACHNOPHOBES BEWARE! IT'S THE GIANT SPIDER INVASION! Time once more for a new edition of the Wormwood Files! 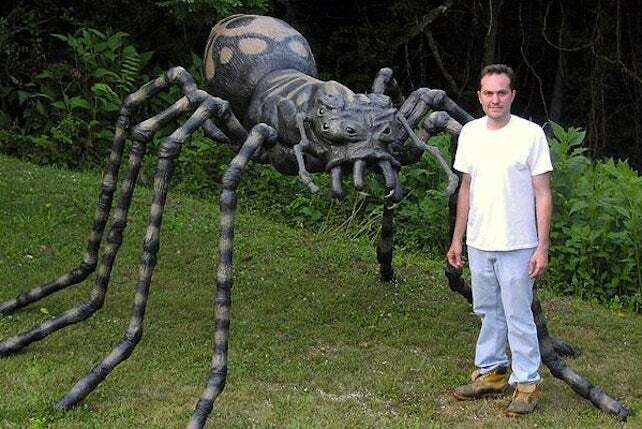 I'm sure you fiends that worship creepy crawly webspinners will be overjoyed to learn we are on the lookout for real life GIANT SPIDERS this time around! Where better to look than the steaming jungle hell of the African congo? It is here that most reports have come of scuttling spiders the size of a German Shephard. These cuties are fairly well known in these parts and called j'ba fofi. We also look at Papua New Guinea and Venezuela as possible breeding grounds for enormous eight-leggers. Grab an economy size can of Raid and join me in my search HERE! Happy to report that we will have an interview with the masterful Hungarian metal band THY CATAFALQUE, who are continuing to chart new courses in the avant-garde. We also to have a live concert report of KING DIAMOND and EXODUS in action. And now for the part you have all eagerly been awaiting...the weekly dive into the depths of the Wormwood Chronicles Torture Chamber!